of the legendary spirit of Texas. It is the seat of government . 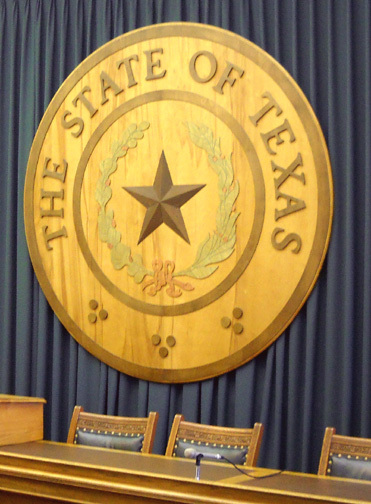 . .
the place where Texans meet to enact laws for the state." I can't believe this is our last full day in Austin. Nine days hasn't been near enough time for us to see everything here that we wanted to see. Part of that was due to the unseasonably chilly and wet weather while we have been here, but most of it was due to our overwhelming need for some rest. We'll just have to come back again! In this entry I'll share a few of the things we did while we were in Austin besides explore local trails. 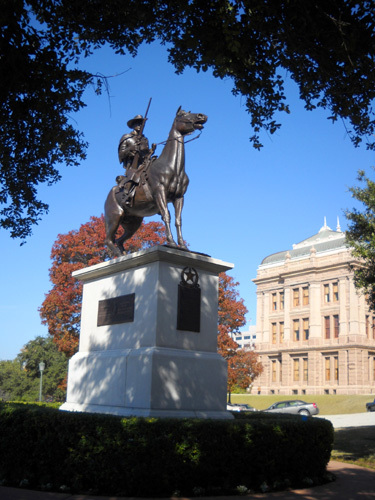 Texas has the second largest land mass of our fifty states; Texans seem to do everything on a grand scale. 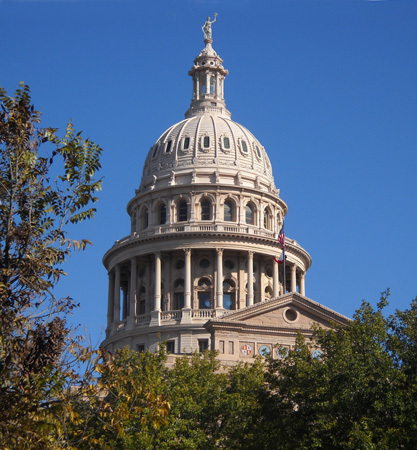 If you guessed that its capital (the city of Austin) would have an impressive capitol (building), you'd be right. 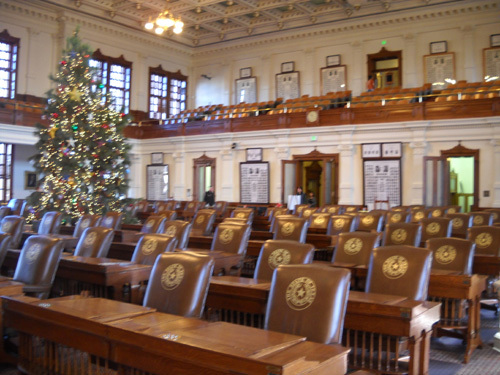 I've seen a lot of state capitols and this is definitely an impressive structure, both inside and out. The building sits in the center of a four-block chunk of land that surveyors designated as Capitol Square in 1839. It is nicely landscaped and full of large trees, manicured lawns, and statues. 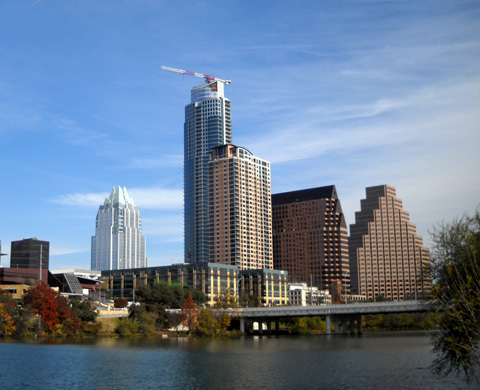 Yesterday was one of the few sunny days we've had during our visit to Austin. 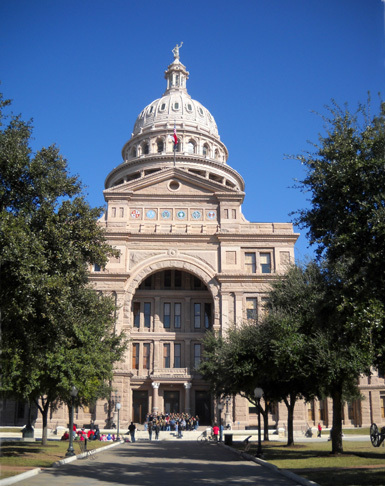 After a workout at the YMCA and a brisk walk on the Town Lake Trail, we drove farther uptown to take a gander at what we'd read is an imposing red Texas granite building modeled after the U.S. Capitol building in Washington, D.C. It is an imposing and very attractive fa�ade. Appropriately enough, the Capitol is located at the north end of Congress Ave. The present building, shown above, is not the first capitol that was built on the property; the original limestone structure burned down in 1881. The new building was dedicated in 1888, modified to its detriment over the years, and renovated in the early 1990s to restore it to its original 1888-1915 appearance (and bring it up to current safety and mechanical codes). There were lots of school kids and adults touring the building either with official tour guides or by themselves while we were there. When we entered the west wing of the building we picked up a self-guided tour booklet. We thought we might join a tour group and get the full hour spiel but by the time we worked our way to the rotunda and foyer, where the tours begin, we found ourselves in a sea of 8th-graders and decided we'd much rather wander around by ourselves than wait for the next tour -- which was also filled with rambunctious kids. That's good, though; I think history feels more relevant to kids of all ages, even 60, when they are in a grand place like this. 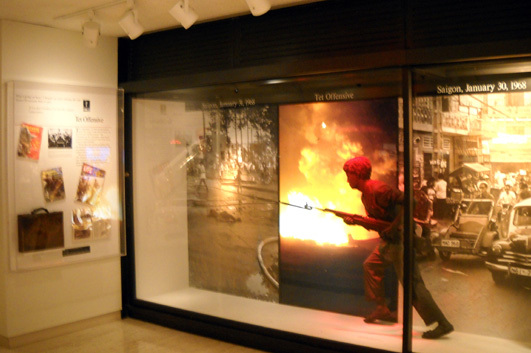 There is so much information in the self-guiding tour booklet and in exhibit cases outside many of the rooms (example below) that we felt we'd gotten the Full Monty without an official guide. There were even more rooms available for public inspection than we had the time or interest in entering. We were there over an hour and could have spent a lot more time than that if we'd wanted; that gives you an indication of the size of the place and the amount of reading material outside each room. Some of the offices, like that of the Secretary of State, are not open to the public. We parked on the west side of the building and went in the door on that wing. The front foyer probably makes for a grander entrance but if we'd gone in there we would have missed the long vista from either the east or west wing toward the center rotunda/dome and out to the end of the other wing. 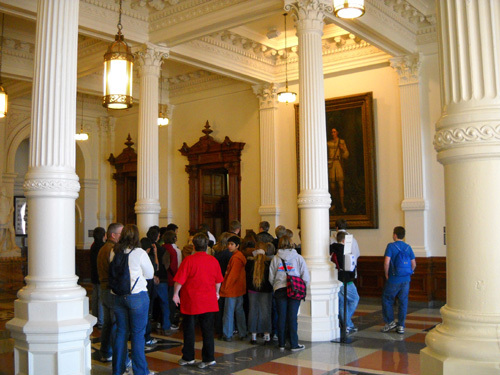 The entrance foyer displays life-sized marble statues of Steven Austin and Sam Houston, prominent figures in Texas history. A bust of the first female governor of the state, Miriam Ferguson, graces the nearby rotunda. 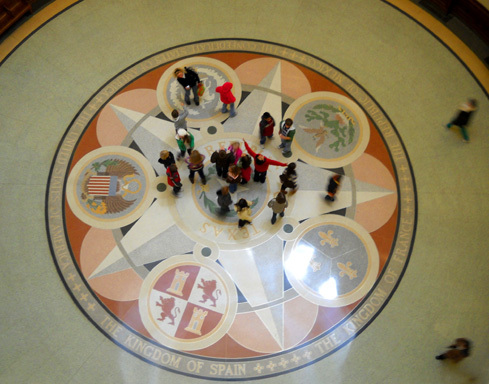 Large oil paintings on the wall and terrazzo designs on the floor commemorate battles fought on Texas soil. Note the "Do Not Touch" sign. Jim didn't see that until after he touched it! 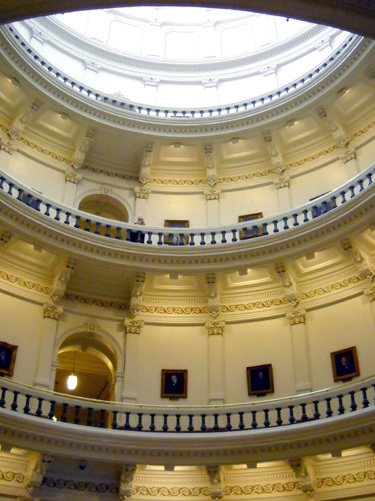 Three areas piqued my interest the most: the rotunda/dome and the two chambers for the legislative sessions. Portraits of the presidents of the republic and the governors of the state circle the four public levels of the rotunda. We were intrigued with those levels and climbed the stairs to each one. The views up and down from each level were very interesting as the perspectives changed. If you go, use what they call the "monumental" stairs or catch an elevator to reach each level and take a good look up to the dome and down to the ground floor as you get higher and higher. The dome fascinated us. I took photos of it from every level! Of course, the detail is better on the fourth level than it is 218 feet below in the rotunda. The full-size (10-megapixel) photos of the design are awesome but I can't show those here. 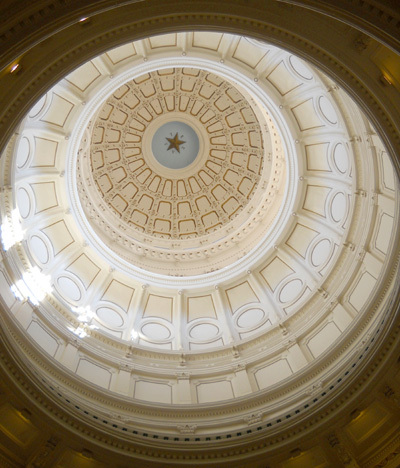 To give some perspective, the Texas Lone Star at the center of dome is eight feet across. For safety reasons, the dome isn't open to the public. When we were up high we noticed metal stairs leading to it for maintenance purposes -- and wished we could climb up there, too. You can see the stairs to the left in the photo above. Note the elaborate designs in the floors through the archways on the second and third levels. The state didn't spare any expense when they built or renovated this building! 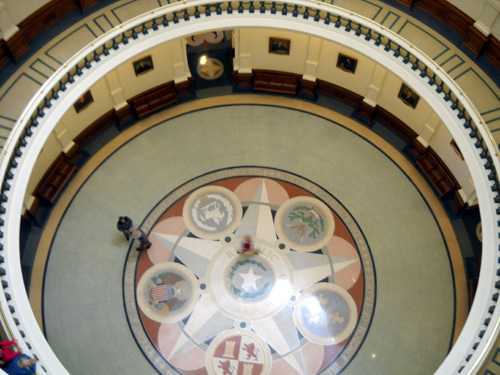 The state Senate and House of Representatives chambers are located in separate wings on the second floor of the Capitol. We were fortunate to be able to explore both chambers; neither body was in session during our visit so I was able to get all the photos I wanted. According to the self-guiding tour booklet we got, "Legislative sessions occur for 140 days every odd numbered year beginning the second Tuesday in January. The Capitol is very busy during sessions. The building is very crowded . 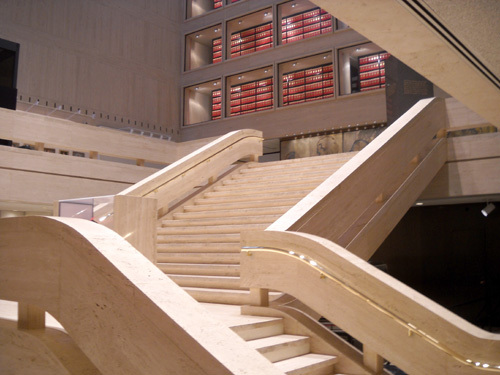 . . usually only the galleries of the chambers are available for touring during sessions." We lucked out. This is an odd-numbered year but the Legislature hasn't been in session for a while. We are amazed that such a large state conducts official business only every other year. Montana did that while we lived there, but its population is miniscule compared to Texas. 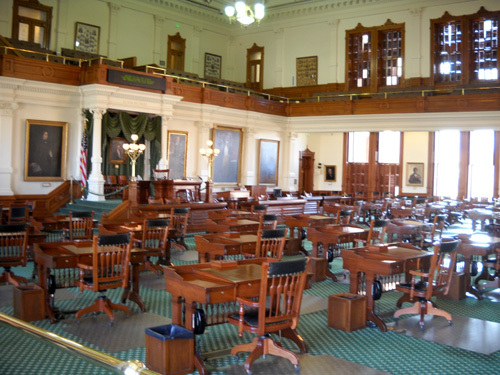 The House of Representatives chamber is the largest room in the entire building. The 150 members of the House work with the 31 Senate members (hopefully, in more harmony than in the U.S. Capitol!!) to enact the laws of the state. Jim pointed out to me a portrait of Captain Audie Murphy on one of the walls. Murphy was the most highly decorated person in the military in WWII. We know him more because of his unfortunate death in an airplane crash just off the Appalachian Trail in southwestern Virginia. I've previously shown photos of his memorial on this website. 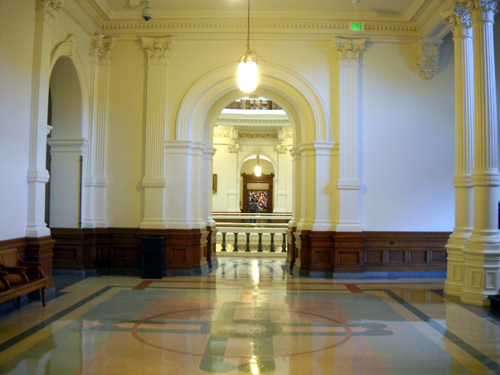 The back of the room showcases two huge paintings by Henry Arthur McArdle that depict a couple of the most important battles in the history of Texas: the Alamo and San Jacinto. 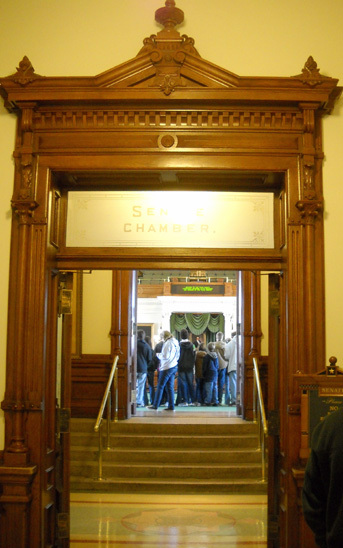 The chamber has been fairly faithfully restored to its 1889 condition. Unlike the House, which has increased its numbers as the population increased, the Senate has always had just 31 members. The walnut desks are authentic, with some modern electronic conveniences added. 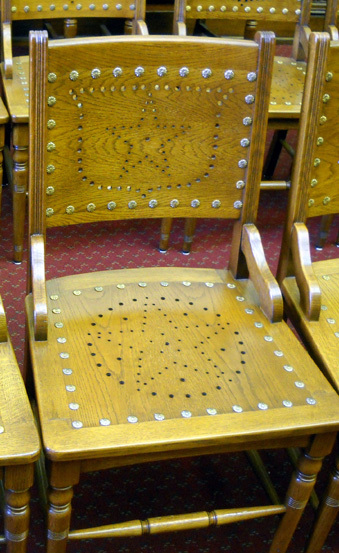 The chairs are mostly reproductions of the originals; they wore out faster than the desks. The second floor also houses the governor's public reception room (the governor's mansion is across the street) and the legislative reference library. We didn't go into those. 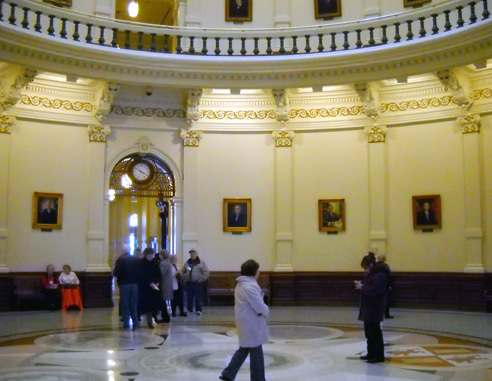 We did not tour the ground floor rotunda (which is below the main rotunda shown in photos above) or the Capitol extension below that. The underground extension contains office space for the legislators, hearing rooms, auditorium, cafeteria, gift shop, and two levels of parking. That's a lot of space underground; either there isn't much bedrock around here or someone did a bunch of blasting! We went out of the grand front entrance when we returned to the truck. A group of high school students (above) was assembling on the front steps. While we were walking away from the Capitol we could hear them singing. What a nice touch to end our tour! 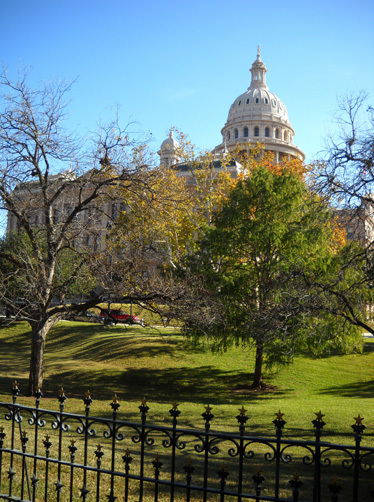 If you're ever in Austin we highly recommend touring the Capitol building and grounds on a pretty day like this. 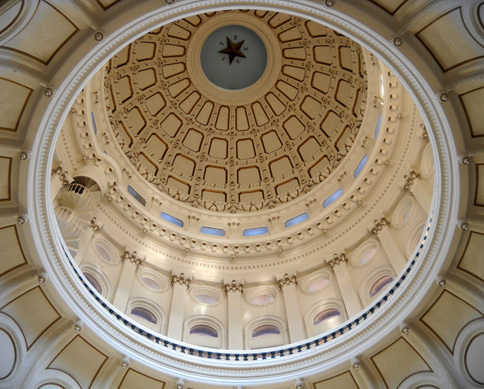 Even if the Legislature is in session, you can still admire most of the architectural details and learn about the history of this impressive building. 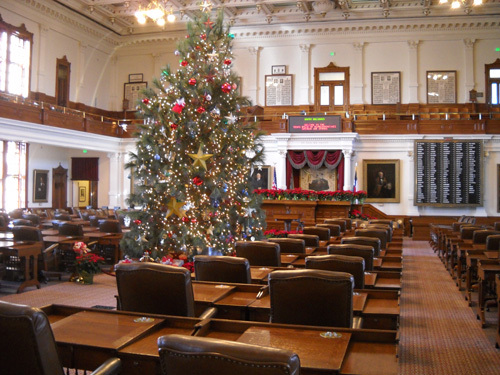 Texans can be very proud of their Capitol. 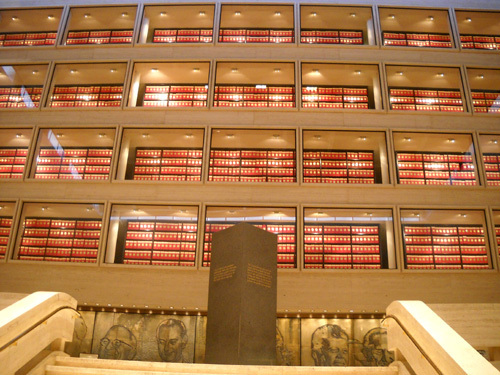 After touring the Capitol we drove a few blocks northeast to the Lyndon Baines Johnson Library and Museum, which sits on the large University of Texas-Austin grounds. 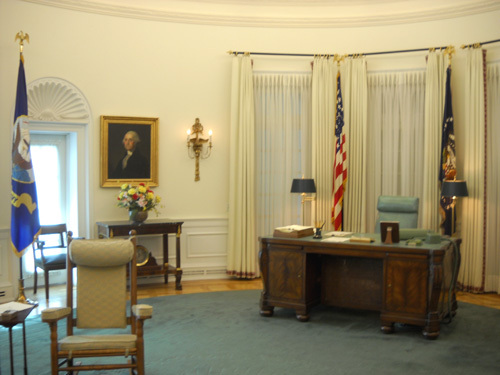 It is one of twelve presidential libraries in the United States that is administered by the federal government's National Archives and Records Administration. The only other presidential library I've visited is the Carter Library in Atlanta. Jim and I spent at least an hour in the attractive, well-organized museum looking at handsome exhibits and recalling various events that occurred during our lifetime. Admission is free and no tour guide is needed. 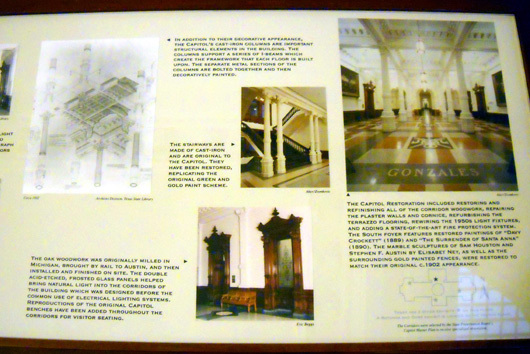 The brochure we got at the reception desk describes the exhibits and explains the purpose of the museum. In President Johnson's words, "I hope that visitors who come here will achieve a closer understanding of the presidency and that the young people who come here will get a clearer comprehension of what this nation tried to do in an eventful period of its history." Eventful, indeed. Several of the most memorable events in Jim's and my lifetime occurred during LBJ's administration. Johnson served as Vice President of the United States from 1960 until John F. Kennedy's assassination in 1963, when he was suddenly catapulted to becoming the country's 36th president. Jim and I both remember exactly what we were doing when we got news of the assassination. 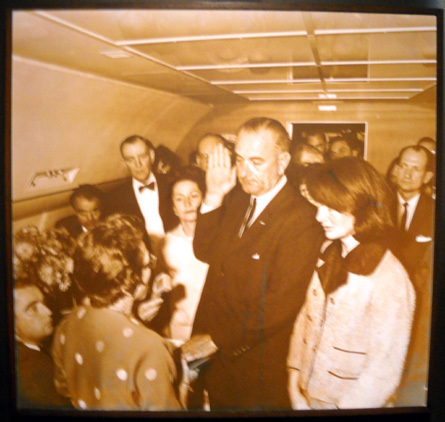 Johnson's hasty, informal swearing in after JFK's assassination; Jackie Kennedy is on the right. He served as President during the beginning of the Viet Nam War, a very divisive period of time in our country's history, and the assassination of Martin Luther King, which set off additional riots and public unrest. Jim's memory of Vietnam is especially sharp; he spent a year there with the Army in 1968-1969. My own worst memory of the war is getting tear-gassed on the Ohio State campus as I walked to class during a riot -- hardly as traumatic as fighting in the jungle but still an eye-opener to me. Both the JFK and MLK assassinations and the Vietnam War are seared in our nation's collective memory and overshadow many of the other things Johnson's administration tackled, such as the war on poverty and the "Great Society" programs. The museum preserves not only Johnson's presidential papers and considerable political memorabilia from his administration, it also chronicles his and Lady Bird's lives from childhood to retirement. I enjoyed learning about their history prior to occupying the White House. We skipped the 20-minure audiovisual presentation of LBJ's life and spent most of our time reading the information in the exhibits on the third (entry level) and fourth floors. 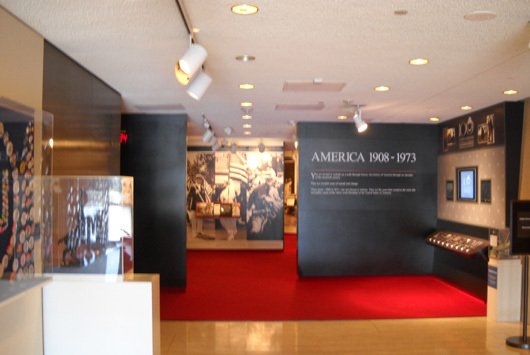 There are permanent historical and cultural exhibits as well as special traveling displays related to American history. 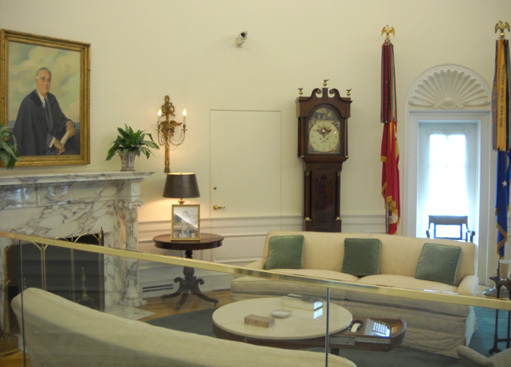 Permanent features include numerous documents and artifacts related to the presidency, sculptures of the President and Lady Bird, gifts from foreign heads of state and the American people, Johnson's 1968 Lincoln limousine, photos of the Johnson family through the years, portraits of every U.S. president and first lady, and even a life-size replica of Johnson telling some of his tall tales (he was known for his Texas humor). The library occupies the fifth to ninth floors (they are short floors). 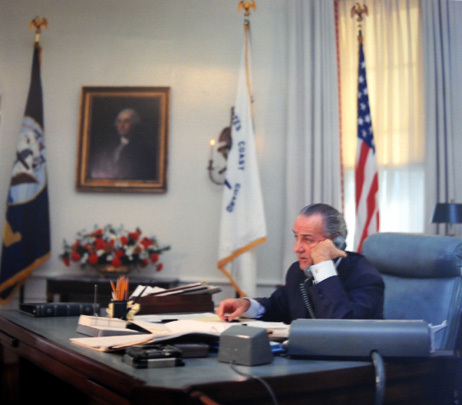 It houses 43 million pages of historical documents, over half a million photos, a million feet of motion picture film, and 5,000 hours of recordings from LBJ's three decades in public office. 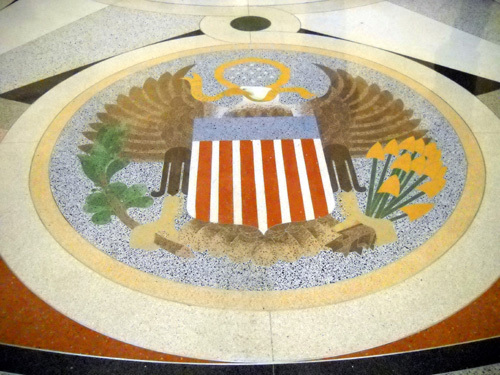 Although most of the archives are available to the public, the Average Joe can't just walk into it; some of the information is still classified. President Johnson did not seek a second term in 1968. He retired to his Texas Hill Country ranch west of Austin in 1969, oversaw the construction of the museum and library (which opened in 1971), and remained active teaching and conducting symposia on a variety of issues until his death in 1973. I'd forgotten that he died only four years after leaving office; good thing he didn't run again in 1968. We enjoyed that walk through history; it brought back a lot of memories, both good and bad. The museum is open from 9-5 every day except Christmas. President Johnson insisted that the library bearing his name exist for the people to visit free of charge. It is reportedly the only presidential library in the U.S. without an admission fee. 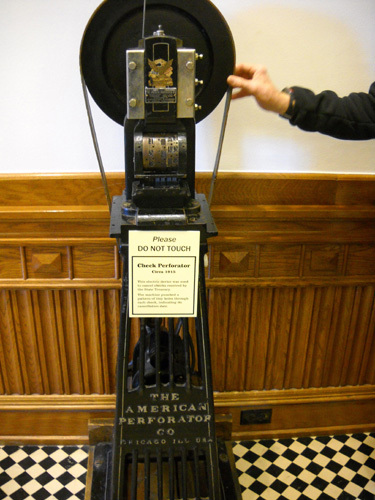 Although the library is under the auspices of the federal government, all funding for the museum exhibits and preservation of artifacts is derived from private sources, so donations are welcomed. Our running friends Marcy and John Beard, who used to live in Austin and continue to winter here in their RV, graciously e-mailed us a list of things to see and do while we were in town. 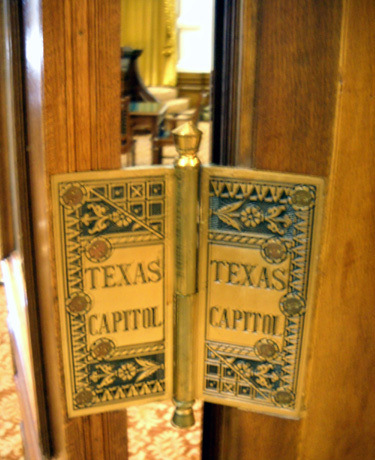 We followed their suggestions to tour the Capitol building and explore Town Lake Trail. If we hadn't needed so much R&R, we would have followed more of their recommendations. Jim and I aren't big on shopping or eating out. The only shopping we did in Austin was at Wal-Mart, Penney's, and Sam's Club; we didn't even go to REI (we don't have one of those in Roanoke so we hunt for them when we're traveling). We did go out for one dinner and two lunches this past week, which is more than we usually eat out when we travel. It was a nice treat to let someone else cook! We enjoyed a meal Sunday afternoon with the Beards at a popular Bohemian restaurant, the Kerbey Lane Caf� on S. Lamar. It is one of four stores in the chain in Austin. We had trouble choosing from among many items that sounded tasty, including breakfast items that are served all day long. Jim liked his turkey and bacon sandwich. I was happy with a big grilled chicken salad with feta cheese, avocado, purple onions, tomatoes, black olives, and a ginger-soy dressing on a bed of baby spinach leaves. The food and prices are good at this casual restaurant. The first time we worked out at the Town Lake YMCA, Jim asked the staff at the front desk for suggestions for lunch. The women immediately pointed up the hill toward the Whole Foods Market. That's the first we've ever been in one of these stores and it won't be the last! We liked it enough to go back for lunch the next time we went to the Y. The stores are located in most states but the closest one to us in Virginia is two hours away. I don't think the chain was in Atlanta when I lived there ten years ago. Somehow it's been off my radar screen until now. On our first foray through the bright, expansive, attractive store we were nearly overwhelmed by the huge selections of luscious -- and pricey -- edibles. It was total sensory overload. This is upscale food, a total 180� from the food section at Wal-Mart, let me tell ya! OK, we aren't that naive or low-class. We have been in upscale food emporiums before but never one this humongous, crowded (what recession? ), or tempting. There were so many choices for lunch that we took at least twenty minutes going back and forth looking at the many selections. I'm serious! It was after 1PM and we were famished but everything looked so good, we simply couldn't decide easily. There is a wide variety of American and ethnic foods from sandwiches and soups to buffets to fresh meals prepared before your eyes. There is plenty of seating on two floors so patrons can eat in if they choose. We both finally sat down at tall chairs around the Trattoria and asked a young man to whip us up some delicious shrimp scampi on angel hair pasta. We didn't have long to wait for our meals. The large servings came with a salad and bread. Jim wandered around hunting for something to drink and came back with an exotic, tasty bottled fruit drink that we shared with our dinner -- we decided that was our main meal for the day. I can't recommend this place more highly. I wonder if every Whole Foods Market is this big and clean? 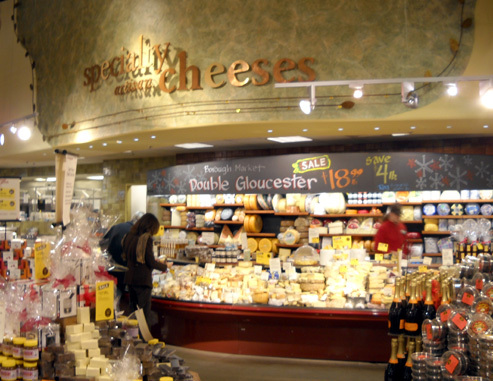 There is a plethora of fresh produce, specialty breads and pastries, meat and fish and dairy products you probably won't find anywhere else within one store, unusual canned and frozen foods, numerous wines and beers and other beverages, and every ethnicity from around the world that you can think of. The only thing besides lunch that we purchased on our first trip tot he store was a loaf of "home made" cranberry-walnut bread that we picked at the rest of the afternoon -- and finished before supper! I think that's like eating cookie crumbs, isn't it? If you nibble a cookie in little pieces instead of gobbling it down all it once, it doesn't have as many calories. Right?? The staff at this Whole Foods is young, attentive, and full of energy. Folks act like they actually enjoy working there, not like it's an imposition if you ask them for help. Customer service is obviously an important part of this store's culture. I can see why locals would be loyal. We liked the place so much that we returned a couple days later and (finally) chose the Indian buffet, where the price of eachr meal is determined by weight -- of the food, not the consumer! Even after being inside the store twice, we still didn't get up and down all the aisles or venture to another floor downstairs. I could spend hours in there just looking, breathing in the scents, and getting inspired for new menu ideas. 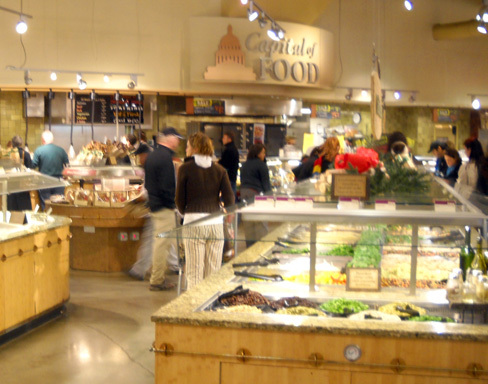 On the internet we've located lots of other Whole Foods Markets in other cities we frequent on our travels; we'll have to make a point of visiting some of them. 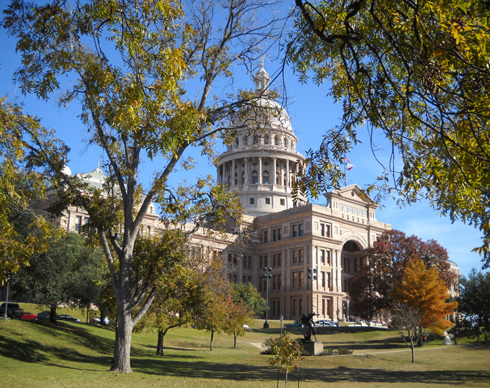 There are lots of things we'd like to do see on our next visit to Austin (possibly as soon as mid-January): the governor's mansion, Blanton Museum of Art, French Legation Museum, Lady Bird Johnson Wiildflower Center (that would probably be best in the spring), and historic residential areas. We'd also like to run and hike more of the 50+ miles in the greenbelt network and explore more of the parks and lakes on the west side of the city. We've enjoyed our visit to Austin but it's time to move farther west tomorrow. We've got a two-day, 1,000+ mile drive to McDowell Mountain Regional Park in eastern Maricopa County, Arizona, our favorite place to hang out in the Phoenix area.